As I mentioned earlier in a post, causes of slow logons can be many things and troubleshooting this is often time consuming. I recommend you to download the ADK tools for Win8 (for the moment it’s for the Consumer preview) and use the “Windows Performance Recorder” and “Windows Performance Analyzer” to help you find the culprit. To get an overview of the tool and some examples, take a look at this excellent TechEd session: How many coffees can you drink while Windows 7 boots? When a computer joins a domain, a computer account is created in AD. The computer account gets its own password that will expire after 30 days (default). When the password expire, the computer itself will initiate a password change with a DC in its domain. So what will happen if there is a mismatch between the computer account password? The computer tries to authenticate, but the DC says this is not the correct password. Tools like “netdom” could be used to reset the password, but this only worked to reset the SC between two DCs. It was not possible to reset the SC on a domain member. The computer had to rejoin the domain. 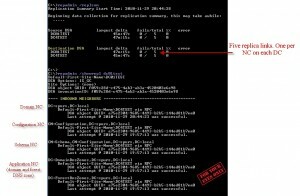 Netdom was written back in the NT4 days, and a new tool has taken over. Not just taken over for Netdom, but also for tools like Nltest. Windows PowerShell. *The cmdlet requires PowerShell 2.0, which is pre-installed on Win7/2008R2. In Win8 there are thousands of new cmdlets, so if you have not began to look at PS. Now is a good time. If you only have 2008 DCs, and you are replicating SYSVOL with FRS. You could/would/should migrate to DFS replication. Like with any major changes you do to your domain, you should run a dcdiag before you do anything. I just saw a case where an old Reference was still alive and stalled the migration. The DC (SYSVOL member) was cleaned out long ago, but it looked like it failed removing all traces. The solution was to delete the reference manually with adsiedit. reasonable time to replicate changes. Value Object Description: "Server Object"
clean up this DCs Account Object. Beware that the “VerifyEnterpriseReferences” tested from a Win2008 DC will report back a “Missing Expected Value” for msDFSR-ComputerReferenceBL. 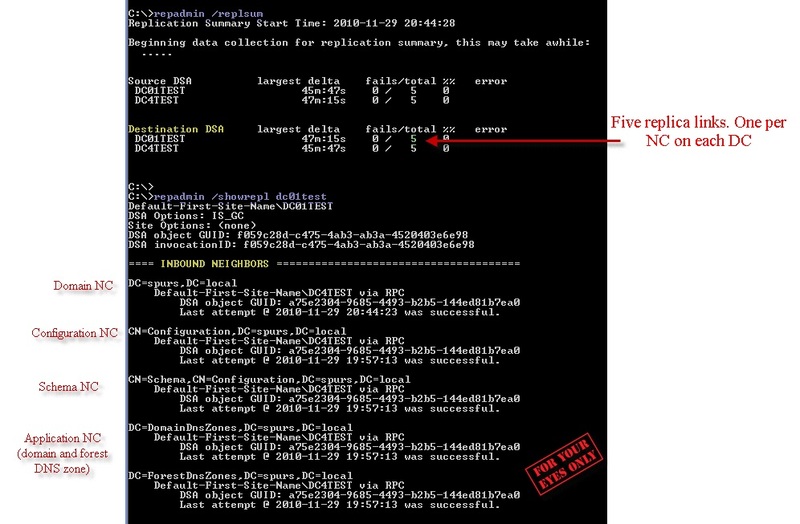 This is expected since the 2008 version of dcdiag don’t know that SYSVOL is still replicated with FRS. So, don’t touch DFSR references. CRM for Outlook installed on the RDS servers. Since you don’t want users to save documents, pictures, etc. on the RDS servers, and you want the users environment to be the same no matter what RDS server they happen to be routed to, you configure Folder Redirection and Roaming Profiles. Doing this will leave your MS CRM installation in an unsupported state as MS CRM 4 and CRM 2011 don’t support Folder Redirection. I opened a support case with Microsoft, and got in contact with the MS CRM team. They told me that Folder Redirection (FR) is unsupported in MS CRM, so I had to remove FR if they should be able to investigate any further. That would be a huge drawback, since we uses load balancing between the RDS’s, and the users would be saving documents directly on the RDS servers. Ouch! There are two files (caches) that have to be local on the RDS for CRM to work. “EmailCache.sdf” and “OutlookSyncCache.sdf”. 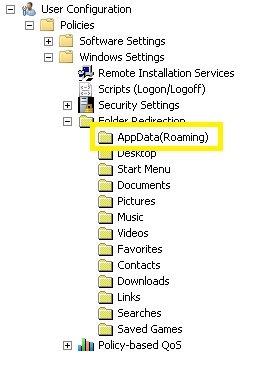 They are located in the “%userprofile%\AppData\Roaming\Microsoft\MSCRM” folder. If you redirect “Appdata(Roaming)” those two files will be on a file share. That will cause problems for the CRM client and present you some weird errors. So if you have to use FR, you can’t redirect “AppData”. That folder has to be local. The rest of the folders didn’t seem to cause any problems redirecting. There are no official KB’s stating that Folder Redirection is unsupported in CRM 4 and CRM 2011, but it is. The CRM support team told me the product team was working on it, and there might come a resolution in the upcoming versions / rollups. In Star Wars, “R2-D2” was Luke Skywalker’s good friend. If you’re running a domain with FRS, D2 is your good friend. Even thought (2008) R2 (and DFSR) should be your buddy. So when should you call your D2 buddy and give him a run? Setting the backup/restore flag , a.k.a. “Burflags”, to D2, and you restart the NTFRS service things start moving. The bad DC will move all its SYSVOL data, if it holds any, into the “NtFrs_PreExisting_See_EventLog” folder. The bad DC will compare all these files with the ones of an upstream partner. It will compare the file IDs and the MD5 checksum from the upstream partner with the local ones. If a match is found, it will copy this file from the Pre-Existing folder into the original location. If it don’t match, it will copy the file from its partner. When the replication has finished (Event ID 13516 is logged), you can delete the content in the Pre-Existing folder to free up space. If you have a domain with a mixture of Win2003 and Win2008 domain controllers, you might get some ”false-positive” errors running DCDIAG.exe. If you run DCDIAG from a Win2003 DC it will not report any errors, but if you run it from a Win2008 DC it will report this error. Dcdiag /s:DC-Win2003 /test:services (run test only against DC-Win2003). If you look at the service on a Win2003 DC, its Type is 0x10 (own), while on a Win2008 DC its 0x20 (shared). So when you run DCDIAG from a Win2008 DC it assumes the Type should be 0x20 on all DCs it runs a diagnostic on. The DCDIAG version on Win2008 will not check if it’s testing against a Win2003 DC. If you try to change how this service runs on a Win2003 DC with: ”sc config rpcss type= share”, it will change the Type to 0x20 and a DCDIAG (/e) will be clean. I had to ask the MS DS team about this, since there ain’t a KB regarding this and they made a KB regarding this issue. If you google it you will get various recomendations to change the RpcSs service to run as shared. The DS team said this is expected behavior from DCDIAG. You should NOT change the way this service run on a Win2003 DC. Leave it as it is, as it will not share its memory space of the instance of svchost with anyone (nobody is requesting to share the space). Even if you change it to shared. We had a problem with some 2008 R2 terminal servers (RDS) with XenApp 6.0 installed on top. When a new user started a published application for the first time, the user got lunched into a full screen session. The “funny” thing was that this didn’t happened to all new users. It was just a random issue. Nothing was logged in the event log, so we tried almost anything to figure out what caused this. We were about to move many users over from 2003 terminal servers, so this was going to be a huge problem. We had read about the bug regarding roaming profile folders that already existed, and you tried to change i.e. “Start the following program at startup”, the change was not applied. In lack of ideas we installed the hotfix on all the domain controllers (2008 R1) and the RDS servers. Guess what, that fixed the random problem launching some users into full screen. I can’t wait for the release of SP1 for 2008 R2! You can request the hotfix here. When you have multiple domain controllers they need to replicate since they are multi-masters. DC1 should hold the same data as DC2 and vice versa, and changes can be done on the DC that suits you (in theory). If you want to have a quick look if the replication in your forest is ok, you can use a powerful command line tool called “repadmin”. If “largest delta” is less than 1 hour (intrasite) and “fails” = 0, your AD replication (not testing FRS replication) between all DCs in the forest is good. If fails > 0 you need to investigate further. Replication is based on pull, so you should focus on “Destination DSA” and “Inbound Neighbors”. If DC01Test had some failures, I would run: “repadmin /showrepl dc01test” to see which DC(s) it can’t pull changes from, or if it’s a single Naming Context or all NC’s that it has problem replicating. Replication is 100% dependent of DNS, so DNS is a common cause of replication problems. The five dots says I have 2 domain controllers in the forest. The first three dots are “processing dots”, while each of the rest represent a DC. 5 – 3 = 2 domain controllers. Inbound Neighbors: Shows the DC’s <source DC> is pulling from and the 4 NC’s (5 links). DSA Object GUID: The GUID of the source or destination. A CNAME named GUID located in the _msdcs domain zone must be present and have a value of the hostname of the correct DC. Last attempt @: last time DC01Test pulled from DC4Test and if it was successful. If a light bulb has stopped glowing, you wouldn’t start with tearing down the wall to check the cables. You’d probably check if pressing the light switch will help you get the light back. If that didn’t work, you’ll move on to replace the light bulb. Still no luck? You’ll move on to check the fuse. If the fuse is ok, is it just this room that is affected? You might look out the window to see if your neighbours have some lights on. Why would you follow these steps? This rule applies to almost all efficient troubleshooting. If you’re going to troubleshoot slow logon issues, then it’s not as easy as the light bulb example. The cause can be hundreds of things. So where should I start looking? Instead of re-inventing the wheel, here is my four favorite MS team blogs regarding the issue. If you take your time and read them, you will have a very good chance to find the culprit.